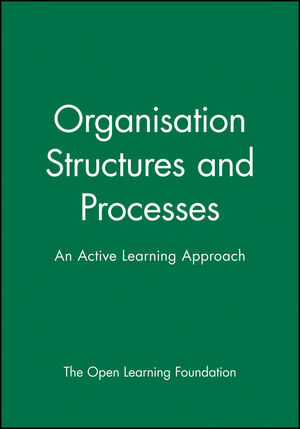 The Open Learning Foundation is the author of Organisation Structures and Processes: An Active Learning Approach, published by Wiley. 2. Designing an organisation's structure:. Life cycle of the organisation structure. 2. Organisational change and its management. Sources of innovation and change. Planned organisational change and the environment. Section III: Communicating in Organisations:. 2. Communication and the organisation. Increasing efficiency of information and communication. Section IV: Identifying and Changing Organisational Culture:. What determines specific organisational cultures?. Social responsibility and organisational culture. Strength of an organisational culture. Models for understanding culture change. The crisis of leadership at Apple Computer. Culture and performance at Jaguar Cars. All the materials are highly developed after intense review by panels of lecturers and student focus groups.